Vault's 2013 associate survey compensation rating results. *Please note that not all associates who took the survey identified their gender. Well, lady lawyers, the results are in. You will likely be disappointed, but probably not overly surprised, to learn that you’re still getting paid less than your male counterparts and working in the lowest-status attorney positions in the firm. The National Association of Women Lawyers recently released its “Report of the Eight Annual NAWL National Survey on Retention and Promotion of Women in Law Firms,” surveying 200 of the largest law firms in the United States for 2013. While the results showed that firms were focusing on achieving inclusiveness and diversity, many firms declined to provide data and women still faced significant barriers to promotion and pay equality, likely contributing factors to their unhappiness in the legal workplace. NAWL’s findings mirrored many of the of experiences reported by female associates in Vault’s 2013 Law Firm Associate Survey, a survey of nearly 17,000 associates from over 150 large and mid-sized law firms from across the country who rated their firms in areas such as satisfaction, hours, compensation, diversity, and associate/partner relations. Let’s first address what everyone really cares about when looking for a job. The cold hard cash. NAWL was unable to provide compensation statistics due to the small number of firms who agreed to disclose compensation information based on gender. Only 48 firms of the 200 surveyed were willing to provide data. NAWL believes that this, combined with previous NAWL surveys, ABA studies, and extensive anecdotal reports, indicates that the gender pay gap for women equity partners remains significant. Bolstering their claim are statistics demonstrating that within the AmLaw 100, 96 percent of firms report that the highest paid partner is male, 92 percent for Second Hundred firms. (AmLaw 100 firms are the 100 largest law firms in the United States. Second Hundred firms are those ranked 101-200 by AmLaw). Vault’s survey found that, as a whole, female associates were slightly less satisfied with their compensation than their male counterparts. 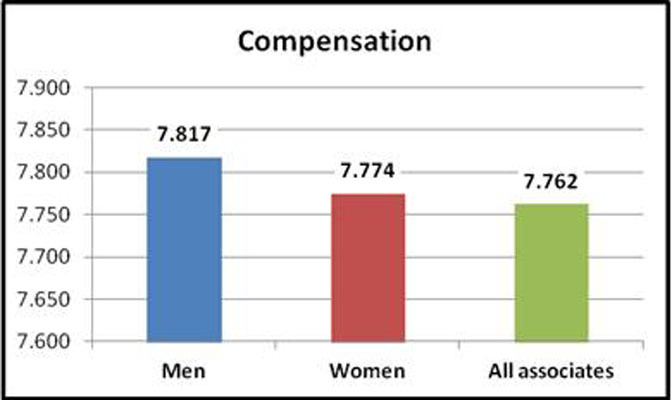 Male associates rated their compensation an average of 7.817 out of 10 compared to females who rated their compensation an average 7.774 out of 10. While this doesn’t necessarily mean that female associates are receiving a lower base salary, maybe they’re just greedier, it may indicate that pay disparity occurs across all levels of the firm, rather than just at the partnership level, as found by NAWL. In addition to enduring a possible gendered pay gap, NAWL found that women overwhelmingly occupy the lower level positions at firms. While firms have a balanced ratio of male to female associates, 47 percent of associates are women, a gender imbalance occurs when moving up through law firms’ ranks. Only 38 percent of counsel are women and only 29 percent of non-equity partners are women. Staff attorneys, arguably the lowest “men” on the totem poll because they are not partner track and junior even to associates, were 64 percent female. Despite some of the less than glowing results from the NAWL survey, it did find that about 17 percent of equity level partner positions were occupied by women. Seventeen percent is positive only when compared to NAWL’s 2012 results that found that only 15 percent of women held equity level partner positions. Perhaps the lack of equity partners at their firms gave female associates who took Vault’s survey reason to pause. Female associates rated their career outlook at 7.657 out of 10 compared to male associates who rated their career outlook at 7.837 out of 10. Some female associates even expressed that their gender contributed to their likelihood of achieving partnership status. Although things may seem bleak for female attorneys, choosing a firm with several key indicators will help women to avoid landing in a job with unbalanced advancement opportunities and compensation. Those factors will be discussed in my next post. Cliffhanger! Have you observed pay inequality at your law firm? Are female associates equally as likely to be promoted to partner as male associates? Let us know in the comments! A BIG thank you to Vera Djordjevich for gathering the Vault statistics and creating the survey charts! FOLLOW US ON TWITTER @VAULTLAW! Why Are Women Lawyers Unhappy?